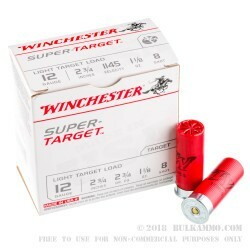 Winchester calls it a “Light Target Load” and they are referring to the recoil profile, but the load itself is a heavier cup full of #8 shot that will give you denser patterning and a better overall performance without the heavy recoil of some of the larger loads you’d normally be up against. The 1145 feet per second velocity gets you on target fast enough and the 1 1/8 ounce shot cup ensures you have enough patterning to split those clays. The round is also suitable for use on small game up to and including coyotes at short ranges. The round is more well suited to small game though, if you aren’t using it on the range for clays and other shotgun shooting activities. Such game includes rabbit; squirrel; birds and other like sized game. 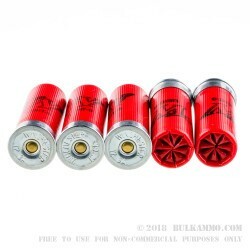 This is a low base round that should function in most semi auto shotguns with no tuning necessary but is excellent for use in pump and break open shotguns. 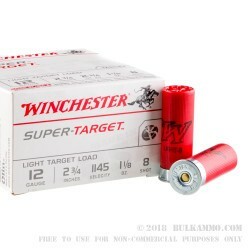 The reliability of Winchester shotshells is excellent with the quality wads and hulls they manufacture and the proper primer ignitions. 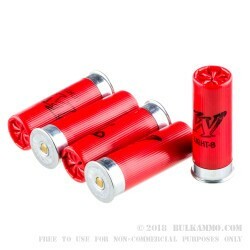 This sporting round may be labeled as a light load, but it performs like much bigger loads without the recoil additions.